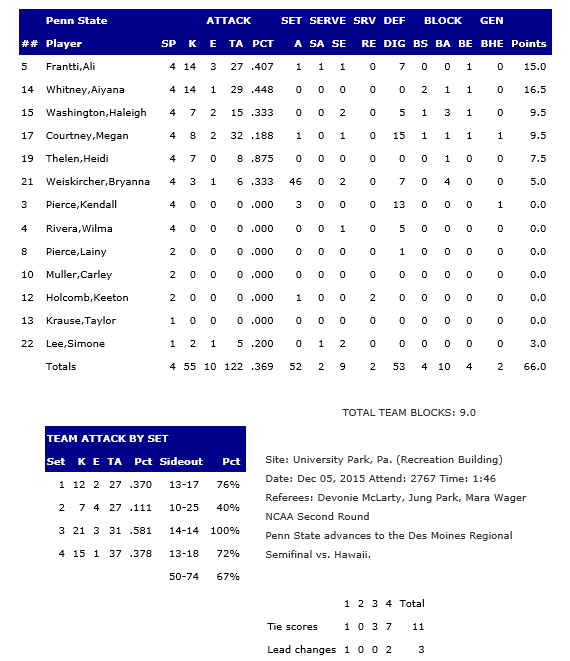 Comparing the statistics for set 1 in last night’s 3-1 win (25-17, 13-25, 25-14, 25-17) by Penn State (28-5) over Dayton (27-6) to the statistics for set 2 in the match, it might seem as if one team or the other was whisked away and replaced by a different, and much better (looking at Dayton) or worse (looking at Penn State) team. 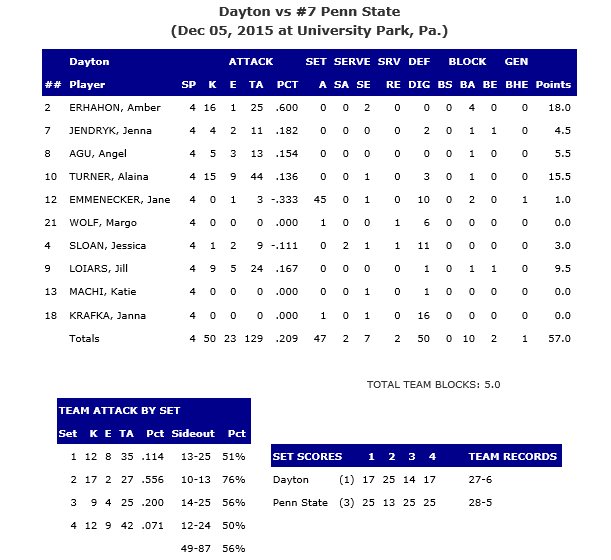 In the first set, Penn State sided out at an impressive 76% (to Dayton’s 51%). The second set, the results were pretty much reversed: Dayton sided-out at 76%, and Penn State fell to 40%. I thought it was a very competitive match. I’d like to recognize Dayton on a great season. They entered the match with the longest win streak in the country [25 straight wins]. We knew that it was going to be a tough match. The video that we had on them was them beating a really good Ohio team, and then I watched Ohio last night go the last few swings [3-1 loss] against [#13 seed] BYU at BYU. So I knew that Dayton was going to have a great fight in them after we took the first game. I thought we did a real nice job offensively. We had a couple kids that got hurt during the match and really gritted it out. I thought it was a valiant effort. I thought Ali [Frantti] played terrific tonight [14 kills, .407 attack%]; Aiyana [Whitney] was great offensively [14 kills, .448 attack %, 4 blocks]; and Heidi [Thelen] [7 kills, 8 attempts, .875 attack %] made a great impact in the match and on our team. I thought that Kendall [Pierce] did a real nice job passing [13 digs, zero errors on serve-receive]. But Dayton’s a terrific opponent. We feel fortunate to advance. We know it’s never a given, it’s always hard, every match has its challenges, and this one [was] no different. So I’m really thrilled with our effort tonight, how we competed — especially after playing as poorly as we did in the second game. I thought we’d side out right out of the gate, as we’ve done traditionally . . . so I thought we’d side out early, and I made a mistake in keeping someone on the floor that I probably shouldn’t have at the beginning, and [Dayton] scored a couple of points. But I think what happened is [Dayton] hit .556, and when somebody hits .556, it’s not so much what you’re not doing, it’s that you can’t stop them. I thought our serving was a little too easy. After that second set, Penn State competed with abandon! 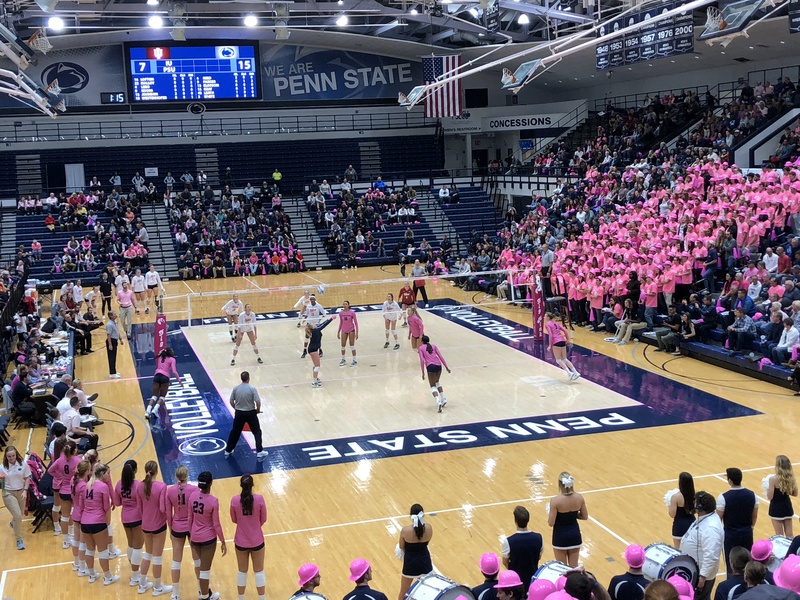 In the third set, Penn State’s sided out at 100% — meaning, every time Dayton served, Penn State scored — and in the fourth set, had a 72% side out percentage. In addition to the aforementioned Frantti, Whitney and Thelen, key contributors for the Nittany Lions included 6-3 So. MB Haleigh Washington (7 kills, 4 blocks), and 6-2 Sr. OH Megan Courtney (who, despite suffering an injury in the third set, led Penn State with 15 digs). We’re not setter-experts (slacker staff rolling on floor, chortling “you can say that again”), but we thought Bryanna Weiskircher put together another solid performance, guiding the team to a .369 attack %, with 46 assists, 7 digs and 4 blocks. We started mixing up our serves in the third and fourth games, and I thought we got a little better results from that. It was a nice team effort — it was nice to watch the kids out there. Kendall and Megan did a great job defensively. It’s nice to advance. 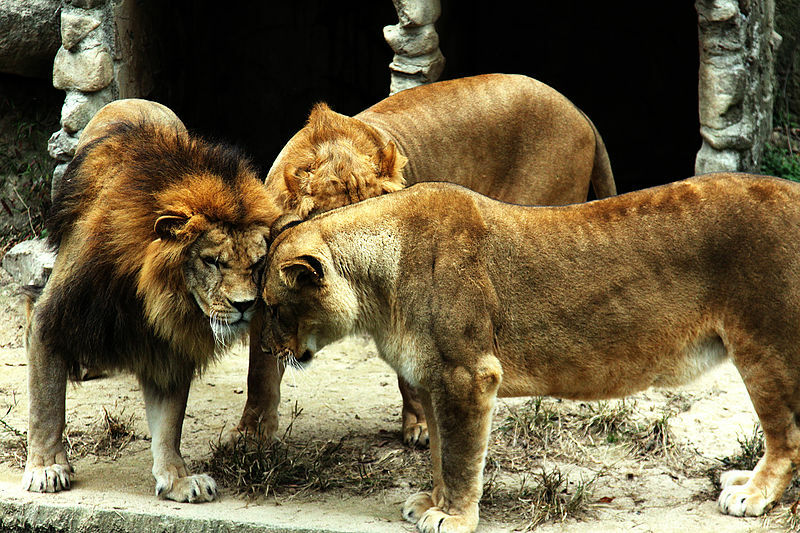 I think they were talking to each other as much as I was saying [things to them.] One team was good one game and the other team was good the next game. We needed to come out in the third game and establish a little better fight, and collective effort. We had a great crowd that would certainly help us if we gave them an opportunity to do that. It’s [never unappreciated] how fortunate we are to be a school that is willing to ante up so that you can host. Not all of the top seeds are able to host every year, because their institutions maybe have other activities there, or they don’t want to put some cash out. You play Dayton at a neutral site and it could be different. They’re a great team. I always have some things to say — some good, some bad — but we don’t rest on our words. The players know they have to come out and play, and I thought these guys [5-8 Fr. DS/setter Wilma Rivera, Heidi Thelen, and Ali Frantti — all of whom were at the press conference] especially really stepped it up. We play hard . . . we enjoy what we’re doing. It was a great team win, so we’re happy. Bryanna does a nice job putting up a good ball. I just did what I could, and swung if I was open. I felt pretty good. It’s a good thing to mix the ball around [as Weiskircher did] because if you keep setting the same person every time, then the block on the other side will just commit to that person. When you open things up, it gets a little trickier for the other team to stop our hitters. With the win, Penn State moves on to the Sweet 16 (Round of 16? ), where the Nittany Lions will face Hawaii on Friday, Dec. 11th in the Wells Fargo Arena in Des Moines, Iowa. We’ll have a write-up tomorrow, with a scouting report on Hawaii by psumaui (a Penn State fan who lives in Hawaii and has watched the Wahine on a regular basis).